A7_Closeout_Envelopes is rated 5.0 out of 5 by 4. Rated 5 out of 5 by robin paris from AWESOME PRODUCTS I have been buying from Jam Paper for my business for decades and the quality runs supreme, consistent and price effective. Rated 5 out of 5 by studio1688 from Graphic Designer Perfect solution to my needs... best price on the internet... will be ordering more.. Rated 5 out of 5 by CMyKolorGraphics from Great Customer Service I love working with JAM for my envelope needs. Because they are so close to my Area the turnaround time is fantastic and if I had to, I could pickup in their New York location. You can't beat their prices. Rated 5 out of 5 by Dream Doodlers from Inexpensive Envelopes We are so glad to find your close out envelopes. We are a small greeting card company. We used to have about eighty stores. For health reasons, we went down to six stores and can only afford these close out envelopes. Thank you for prompt service and a product which is quality. I'm interested in the A7 closeout envelopes, shown in various colors. But I can only see blue available. &nbsp;Do you have all the other colors shown? Yes, all the colors shown are available. If you are having any issues ordering, please contact us at 1-800-8010-JAM (1-800-801-0526). Can I get 4 samples of this envelope? Yes. Please fill out the email form at the bottom of our &quot;Contact Us&quot; page: http://www.jampaper.com/contactus.asp. Thanks! Are these bright white? Would you be able to send me another image? Hello! This is not our Brite White Wove color. Sorry for any inconvenience this may cause. Yes absolutely! Vellum suggests that it is smoother than the regular envelope too! what is the weight of these- is it a light paper like an inexpensive #10 commercial envelope, or is there some heft, more like an invitation/note card purpose weight? We would say it is more like a commercial envelope weight. Is the 24 lb white wove envelope more close in weight to a Sub 80 or a Sub 70 envelope? I'm looking for the heavier. 24 lb is closer to sub 70. Sorry for any inconvenience this may cause. Finding the right envelope can be tough, so we’ll make it easy on you. A7 Closeout Envelopes are versatile, low-priced and look great. 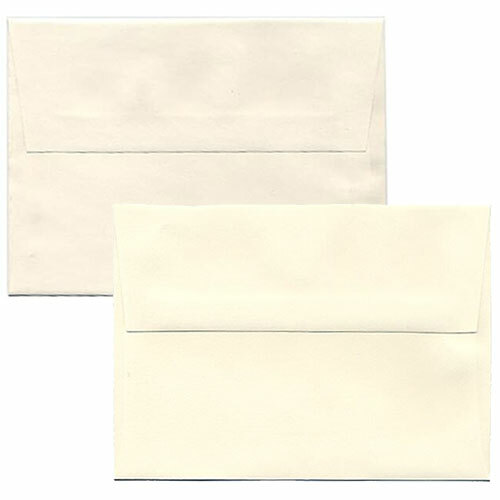 These multi-purpose closeout envelopes are available in a wide variety of white, ivory and blue. Great for birthday cards, invitations, letters, greetings, announcements and more, A7 Closeout Envelopes are perfect for anyone looking to buy in bulk. They measure in at 5 1/4 x 7 1/4 and ship in quantities of 1000. This way you can have enough for the whole company or the whole year. At a low price and great deal, what more can you ask for? With over 10 colors to choose from, you are sure to find one that fits your style, event, and theme you're going with. Items may be listed on closeout for a number of reasons, from a discontinuation to something as simple as a name change. But don't worry, A7 Closeout Envelopes are all-around quality envelopes.